On our web site you are able to select and purchase nearly any pump on-line with your credit card and if you know how to select the right pump for the job, this makes purchasing very easy. If you are unsure or, if you have no idea which pump is the correct one for your application, we will happily assist you. The table below provides a good indication of which pump will be the most suitable for your particular situation for a house supply pump. This table assumes that the water tank is above ground and that the pump is beside the base of the tank with less than 10m of pipe to the house. All of these pumps are Grundfos CMB-SP or CMBE series and have automatic on/off controllers that provide protection against running dry. Excellent quality with an extended warranty when you purchase the Grundfos pressure tank over the phone at the same time. 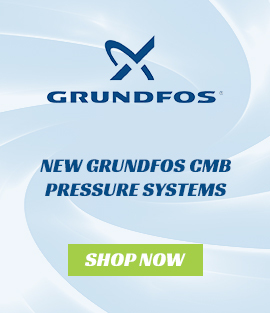 A Grundfos pressure tank in your system will reduce the number of pump starts by up to 50% or even more, this saves money and extends the life of the system. A Grundfos CMB-SP series pump installed correctly on a house should last more than 15-25 years. You can contact us by phone on (02) 6732 6333 or 1300 661 417 during normal working hours or, send an email to us at rod@pumpwarehouse.com.au with you contact phone number and the most suitable time to call and we will phone you. Please, if you're going to send an email, don't spend your time drafting detailed descriptions of your situation as chances are, we will need more information so feel free to give us an outline but include your phone number so we can call you to give you the best recommendation.